On this page you will find our advice on instrument care and maintenanace. Why look after an instrument or bow? Does it really matter if it is filthy and dirty and covered with what looks like a 'second skin'? Does it matter if the varnish is scratched and chipped and tiny pieces of wood are missing from the edges and corners? I hope that these questions and others will be properly answered in the following sections, but the one answer to all these questions is 'yes'; it does matter. The value of most stringed instruments and bows has increased considerably over the past years and is set to continue. The actual value of an instrument or bow is in a large part determined by its condition. Professional restoration and repairing is a costly business and in many cases can be totally avoided by relevant knowledge and a magic word called 'prevention'. Owners of instruments and bows should consider themselves as 'custodians' and would wish therefore to pass their beloved instrument to a new owner in its best condition. When an instrument is not in use ALWAYS return it to its case with the lid securely closed. Keep it away from heaters, central heating and direct sunlight, even when it is in its case. Always loosen the hair of the bow when it is returned to its case. NEVER lock a case. If the key is lost, entry to the case could cause extreme damage to the instrument. Always make sure that items like pencils, mutes, shoulder rests etc are secure in the case and not allowed to roam free in the case. Cover the violin with a large pure silk scarf or silk 'pyjamas' when it is in its case. This will help to insulate the violin. Have a clean duster in the case at all times. NEVER put an instrument on a chair. Chairs are for sitting on! Need I say more? NEVER leave or store your instrument near central heating, even when it is in its case. Put the case with its instrument into a cupboard or wardrobe. Avoid touching your instrument with your hands. Handle it by the neck only, supporting it at the chin-rest end with the other hand. Under no circumstances should you pick the instrument up by any part of its body. If you see any finger marks on the instrument, do the following: breathe some hot air onto the affected area and simply rub over it gently with your clean duster. It's as easy as that! Always clean your instrument after use. Pay particular attention underneath the bridge and other areas where resin deposits have gathered; under the fingerboard, on the fingerboard and the ribs. Failure to do this will allow the resin to gradually congeal and make it almost impossible to remove except by a costly restorative cleaning. It is best to keep a duster in your case at all times (a soft material one is preferred to the traditional 'yellow duster' which tends to 'moult'; make sure you wash it regularly!). Never use cleaning agents of any kind unless highly recommended. There are several special polishes on the market for stringed instruments, but we prefer to not use them. Most commercial violin cleaners are in liquid form and therefore almost impossible to completely remove, even with extensive polishing. If the instrument is in a clean condition and not in need of restorative cleaning, we recommend a product which is in a wax form and has been proven beneficial over many years. Renaissance Micro-Crystalline wax polish By Appointment to Her Majesty The Queen Supplier of Products for Restoration and Conservation. If you do not touch the instrument's body, then there is no need for any cleaning process. The magic word here is 'PREVENTION'. However, after a lengthy period, usually about a year to eighteen months, the instrument may begin to look 'dull'. Take it to a reputable dealer/restorer who will give it a gentle clean and should not charge too much. Even correctly fitted pegs need attention. There are generally two main problems; they either click or refuse to turn with ease, or they slip The clicking peg needs to be removed, cleaned [acetone is a good cleaning agent, but never clean near the instrument or have the bottle open near the instrument], and a little peg past applied. 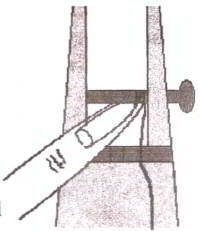 In most cases of the slipping peg, it is the result of the strings being fitted incorrectly. Please see below for the correct fitting of strings. NEVER use chalk to prevent slipping. Without a doubt, one of the most frustrating problems for any string player, is the peg that continually slips and more often than not, during the course of a performance. Most of us have experienced this at some time and will blame the pegs, asserting that they have been fitted badly. In some cases this is true, but in the majority it is the simple fact that the strings have been incorrectly threaded onto the pegs. Before giving you a simple, step-by-step procedure to ensure the correct fitting, it is important to understand how this method works. As we turn the peg and increase the pitch of the string, we are exerting a little pressure inwards. The excess string which is winding onto the peg as a result of this, is pushing in the opposite direction and subsequently pushing the string against the inside of the peg box. We have in fact a situation where "opposing forces" are at work. This creates a very desirable 'locking device' provided - and this is the most important point - the actual string, when it goes onto the peg, is running flush with the inside of the peg box. If you are putting a new set of strings on your instrument, never remove all four strings at once. Remove and replace each string separately. Step 1. Lower the pitch a little on each string in the following order: A, E, D, G (for viola and cello: D, A, G, C). Step 2. Remove and replace the G string first (C for viola and cello), bringing it almost up to the pitch. Step 3. Remove and replace the remaining strings in the following order: E, D, A (violas and cello: A,G, D). Step 1. Remove the peg from its hole in the peg box and clean the shaft (use Meths, acetone or similar cleaner). Apply a small amount of peg paste to the areas of the shaft which come into contact with the peg box and begin to turn gently several times until the peg moves smoothly. if it still 'clicks' then a little more peg paste may be necessary. Step 2. Thread the string through the hole, allowing no more than about 1 inch to come through the other side. Step 3. Begin to turn slowly, bringing the string over to the inside of the peg box immediately with the index finger of the other hand. Make sure that the one inch of excess string is locked into place by the oncoming string. Step 4. Continue keeping the index finger against the string and the side of the peg box; turn the peg without using any pressure until the string has been wound onto the peg. If this procedure has been successful, you will notice a gradual 'tightening' feeling as the excess string winds onto the peg and presses against the inside of the peg box. This is the desired 'locking device' mentioned earlier. 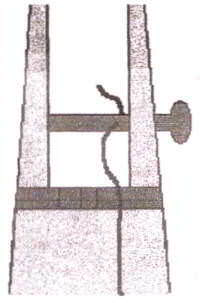 In some cases however, it may be necessary to use a small amount of pressure when turning the peg, in order to achieve the desired 'locking device'. The bridge should last a hundred years if it is looked after properly. Check your bridge every week to see that it is upright. Remember that continual tuning will have the affect of pulling the bridge towards the direction of the scroll. If it is starting to move forward, then pinch each string gently just in front of the bridge and this will effectively move the bridge back. If the bridge appears to be warped badly, then it is time to take it to a dealer/restorer who will, in most cases be able to un-warp it. If the bridge has fallen down, then you must have it put back again by a restorer/dealer. If it is not returned to the correct position, the whole tonal quality of the instrument will have been changed. If the sound post has fallen down, never try to replace it yourself. This again, is a job for the expert. The sound post may appear simple, but in fact, is one of the most important parts in the instrument for creating a balanced and regulated sound. The French call it 'L'Âme', meaning 'the soul'. Equally, having the sound post adjusted should be avoided and done as a last resort. Never do this yourself or even by a well intentioned teacher/violinist. Have patience with your instrument. They are sensitive creatures and sound healthy and responsive on dry, warm days and like us, are not at their best when it is damp and cold. Chang your strings fairly regularly and not only when they break. They loose their resonance with a lot of playing and even the E string on the violin! We wish you many years of happiness with your instrument and hope that you have few problems. If you encounter a problem, take it to a respected restorer. D.I.Y. is a term that should not exist in the stringed instrument World!